I got with the Mason Jar trend a few years ago when I bought a stamp and die set and I haven't used it lately and when I saw a Mason Jar and it had a little doily label that went with it on the CTMH Flower Market Cartridge I decided I needed to revisit my love of Mason Jar cuts. The one thing I have problems with is making a jar look like glass. For this card I went with the palest of blue's cardstock and then used some transparent paper over it and while it doesn't look clear like glass I thought it could pass for a milky colored glass. I went with the Sweat Pea cut for the flowers in the jar and they were really easy to put together. and luckily I was able to get it sized about right. I tell ya this whole not using Make The Cut is driving me bonkers since I am so use to how that program works. I still don't like the "glitchiness" of Design Space or how I get lags at times and I know it's due to it being connected to the internet *okie still thinks that's about a crock of chit* but in order to use the Flower Market cartridge I have to endure the pain of using the program for more than just cutting. To give the jar some dimension I curved it around my Scotch Quick Dry Adhesive bottle and applied some mounting foam down the middle of the jar and ran a thin like of glue down the sides of the jar. This picture doesn't really show the dimension all that well and I couldn't figure out any other way on trying to show the effect. 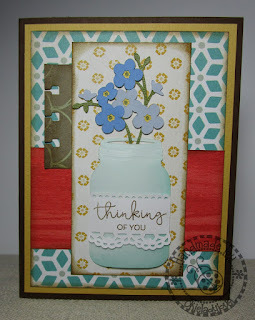 The "thinking of you" was from the stamp set that comes with the Flower Market Collection and there are a number of great stamps in that set for quite a few different occasions. I totally lucked out that this stamp fit on the doily ban after I got it cut because I didn't even think to measure it first. And I would like to add I was a bit nervous about cutting that doily due to the intricate details and the small size but the Cricut Explore handled it like a champ and gave me great cuts on all 6 doilies. Why 6 you say? Well because *and okie thinks everyone should know this by now* I usually always make 6 of a card so I have extras when I need them. Wow, really cute card! I love mason jars too and I have several in my stash but rarely use them! Thanks for the inspiration, like the explanation about the dimension. Very cute!!! i like how you curved the jar!! 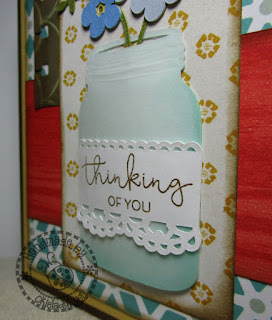 Lovely card, and thanks for the mason jar inspiration. I just bought a mason jar stamp, now all I have to do is find it and use it.